I recently discovered I dig doing my nails. I'm not very good at it but it's an almost therapeutic activity. 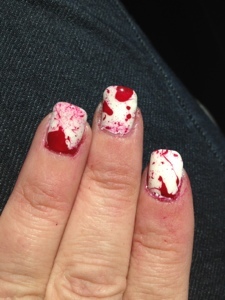 So, here are my terrible photos of my relatively ok manicures. I'm starting to get in the mood for Halloween, it's my favorite holiday. 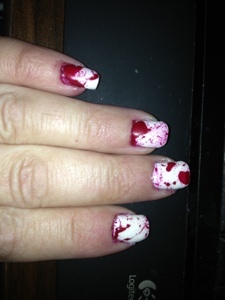 So yesterday I did the blood splatter nails...really, really should have taped my fingers. Such a mess but it was fun to do. Added bonus - they glow in the dark. For this I used Piggy Polish Nocture-Nail (for the glow in the dark goodness), Fingerpaints Signed in Wine, Sinful Colors White on White and my current favorite top coat Seche Vite.